Your computer may continually restart, sometimes load the Windows logo screen, or even just have a black screen. There are a number of symptoms that occur when you have a damaged boot sector such as the master boot record. What is a boot sector of a hard drive? Your hard drive is split into small sectors and the first of these is the boot sector. It is the most important and is obviously accessed first when the computer first boots up. If your hard drive is not partitioned it will have a Volume Boot Record. What is the master boot record (MBR)? The Bios looks for a boot sector of your hard drive. If the hard drive has a partition it will go to the Master Boot Record. This tells BIOS about your partition table and where the operating system is that you want to boot up. What can damage the Master Boot Record in the Boot Sector? Having problems when installing Operating Systems can damaged the master boot record. Stopping half way through installation is the most common cause. Changing the Windows Registry entries. Getting a virus that infects the MBR. Many viruses are built to attack the MBR. You will need to know the administrator password for your Windows installation. Put your original Windows XP CD into the cd drive of your computer. If your PC cannot enter Windows, or your Windows has problems, this CD can help! Restart your computer and hopefully it will come up and say press any key to boot from the cd. So therefore you must press any key on your keyboard to start from the cd. If this does not come up you need to enter your bios and change the boot order or sequence.See How to get into Your BIOS and change settings. A blue screen will appear and you are on your way..
You may need to press F8 to agree to the Windows Setup agreement. After that the setup options will appear (see screen shot below). Do not press ENTER as it will start installing Windows from scratch and you will loose all of your data on your hard drive. Press the letter R on your keyboard to enter the Recovery Console. When Recovery Console starts you will have to enter the number that corresponds with the installation you want to repair. For example if you have only one Windows installed on your computer then you would press the number one key. If you have two operating systems on your computer and you want to repair the second one then press 2. Enter your Administrator password for that windows installation. You must enter an admin password here and if you do not, you cannot continue. At the Recovery Console command prompt, type fixmbr. You will be asked to confirm that you want to do this by pressing the Y key for yes. Now your Master Boot record will be fixed. Now if that did not work you can also repair the Boot sector by following the same steps but typing fixboot instead of fixmbr. This screen shot below shows what you will see when you insert the Windows Vista or Seven operating system cd. You can try to do a Start up repair first. Generally this repairs Windows problems. If you want to fix the boot sector of a hard drive you will need to choose the Command Prompt option, as we did for Windows XP. Type Bootrec.exe, and then press ENTER. This will let you into the Bootrec.exe tool where you can type try to repair the boot problems. Please see more options on how to repair startup using the Bootrec.exe tool. For earlier versions of Windows you can type in Fdisk /mbr at the command prompt. Before typing fixmbr or fixboot you can type chkdsk and this will check your hard drive disk for bad sectors and offer to repair them. A hard disk only has a MBR if it has been partitioned. If it is a new hard disk drive it will have a Volume Boot Record (VBR). When it has been partitioned it will have a MBR instead. Also see more about your computer has a black screen or a black screen with a flashing cursor. I am sorry I cannot help everyone here case by case but I do appreciate your comments and questions. If people share their experiences below we will all learn more about this problem. Please comment below and let us know how you repair or fix your boot sector? #100080 Hard disk need to be ( I don’t remember wat it was but it was either-) repaired/fixed. I don’t remember specifically but it was a problem with my hard….or was the word hard drive….-sighs-. Anyways i redid the test got the same result except this time. When i pressed enter to leave the test result screen and back to my many choices. I was brought to this screen that said error #303 blah blah blah. It was like a short sentence. Now the thing is i tried exiting pressing F8 and all the things i could think of to get out. There was only one choice i had. Now the thing is i can hear the regular sounds of my computer coming on the fan and all that stuff ( Except of course the welcome song which mean its still stuck at the windows logo screen). I am so upset i don’t know what to do, i think i made it worst i think i might have ruined it. If you are using a copy of Windows or an old disc I suggest you make a new copy on a new disc and try that. maybe it cannot read the files on the operating disc. this has happened to me many times. My discs get worn or dirty and I just make a new one. If you want repair the boot sector by fixing the master boot record (MBR) in Windows XP, use any hard disk repair software like Kernel for NTFS data recovery software makes the complex process of disk recovery extremely simple to you. Recovering deleted files is now an easy task with this advanced scanning mode and also repair master boot record error. if your data is precious I would not recommend you do anything yourself. Otherwise you are risking complete loss. If you are willing to risk your data for a few experiments then the tutorial above might help. Also a Windows disc can do wonders. the problem is blue screen appears at time i put my anti virus for scanning and laptop shut down..
i used all tools and anti viruses.. I have a HP. My computer was working fine until my 15 yr old needed to do some homework. I usually use explorer?.he used google chrome. In the middle of his paper the computer had a blue screen and asked for us to shut it down. We did and restarted it (not in safe mode..not offered). It seemed to b ok..I went on fb and my computer shut down and went into updates…so I left the room. When I returned..the HP logo was blinking off and on..I let it do that for a few minutes. I finally shut it down. Once I turned it back on it was black with a ( – ) on the top of the page. I don’t keep my sound on so I’m not sure about any noise..this is my work computer..I need it bad…Help! Hi, my hard disk just crashed and am not able to boot normally or in safe mode. next I tried windows CD repair mode and tried fixmbr but it gave an error and didn’t work. when I tried to access the various drives with dir command to list the files, none of the 3 drives of my hard drive are accessible. please help. I have win xp home edition.I got a black screen with the blinking cursor. I cannot get into safe mode I just have F2 And F12 , I have my win cd ful version. And I tried the repair but nothing happened I now have missing NTLDR a corrupted boot sector.I did the fixboot,fixmbr.I have Chkdsk done the test and they passed. Nothing changes. Any suggestion would be greatly appreciated. Hi there, I really hope you can help me with a problem that needs to be resolved very urgently. I am trying to help my neighbour fixing her notebook HP Compaq Presario R3000 and tried to do a Windows XP repair installation but it got stuck at 39 minutes installing. Will it be safe to boot up via Hiren’s Boot disk and do a MBR repair with the MBRWizard? Please, I am very worried and she is a teacher who needed her notebook as of yesterday already. Sorry to bother, but awaiting your reply eagerly. Kind regards. One addition to the article above, if you don’t have a password, you can just hit enter. I have a fix the might work for bad sector(S) in the mbr. First, you got have windows xp or above installed. Make sure the partition is activate. Do the above in the article. Before running fixmbr, also run fixboot. The run fixmbr. It may not work for you. A family member has a Dell computer which is close to two years old which will not boot up. It shows the Dell screen and then it just goes black with a blinking cursor. I asked if a restore disk was available, but there is none. The only disk available is a documents and drivers, no restore. Had the computer run a couple of test and all passed. Pulled the memory out, cleaned them and put them back in, rebooted and still nothing. Do not get a beep or anything else that could help. Is there anything that be done? Please help! My church has a 1 year old HP computer with windows 7. It will not boot past a black screen with a blinking cursor. I can use the Windows 7 startup repair and it says it repaired an invalid system partition. The computer will boot and work fine with no problems untill it is rebooted then the same thing happens. I can run the repair disk again and get it going. It happens everytime the computer is shut down & restarted or rebooted. I have run several different virus scans and they cant find anything. Is there any thing else I can try? What about going into the bios and setting the boot order to go straight to the hard drive..
Open My Computer by going to the link in the start menu, right-click the drive icon (c drive) and choose properties from the menu. Switch to the tools tab and click “check now” under Error checking. I changed the boot order and did the error check and it seems to be working now. Couldn’t tell what the result of the scan said because the screen went by too fast. Anyway Thanks for your help! my vaio pcg-k315z has got an error report in start up and got an empty desktop unless i log off and log again to get my desktop , then the error keeps on when i lounch IE , and then if accepet it the IE close unless i leaft this error on it will work normal . No probably not. Next time You could take the hard drive out and put it in an external case, plug it into another computer to get the files off..most of the time this works. Then you can put it back and format it. Fixed it: Clonezilla copied the old disk, including the restore partition, and made it bootable. Ghost 9 did neither. working on a laptop at boot it said starting windows and stays there till i turn it of is an acer aspire 5100 it will install windows almost to the end when it reboots windows logo stay like is brething thank you. Can you put the Windows operating system cd in and do a repair? It sounds like your hard drive boot sector is fine. if you want to save the data on your hard drive before you could try putting it in an external hard drive.. I am not familiar with the HP diagnostic.. Did you get to the recovery console in XP and type in fixboot? If you had blue screens showing this might mean hardware.. You should buy a POST diagnostic card to find the problem. Also here is an article about what the post card does..
Don’t understand what to do? i have a desktop computer that was fine til one that i turned it on and it just have a black screen. i tried everything! and it didn’t work. what should i do? I just bought a new computer so I basically just want to get this one booted up just once to ensure I got all my data off of it? If you have Windows Vista or Seven the instructions are slightly different! Please see that section in the article. Here is one black screen blinking cursor solution for disk corruuption that worked, after trying all others I had found on the net. This was on an Xp machine, but should work for Vista or Windows 7. An Hp Xp desktop had the black screen during boot with blinking cursor. This was caused by a failing power supply, that would shut off unexpectedly. It cause corruption of the hard disk. If you think your disk was corrupted in a similar way, try this fix. I had many years of experience troubleshooting Pc issues, viruses etc, but this had me stumped for a while. I tried fixmbr and two dozen other things replacing files needed for OS startup etc, but to no avail. Solution: I had a spare hard disk on hand, and an Xp install disk, although not the same version that came with the Hp system. ( dosent matter). I also had backup software that can create an image of the hard disk. I used Acronis 2009 home edition, which is useful for Xp and Vista. Newer versions are required for Windows 7. 1. Use an Acronis boot disk, to backup the defective black screen disk to an external USB hard drive. During the backup configuration, select all of the partitions. 2. Remove the bad disk drive, and install a good drive similar to that of the original. 3. Boot with an Xp, install disk, and install Xp onto the new hard disk. After installation, the Pc should boot to that new version of Xp. Dont bother to update the software, or Windows update etc. 4. Reboot with the Acronis boot disk, and backup the new disk, and all of it’s partitions. 5. Use Acronis to restore the drive C partition on the good disk, using the C partition from the acronis black screen backup that contains all of your data. Notice, that when selecting which partions to restore, Acronis shows that drive C has a boot sector, and a data sector. Also possibly a restore partition as is on many OEM desktops. Only restore the C data, NOT the boot partition, to the good working disk. This will restore your data and OS, to the new disk with a good boot partition. After the restore is complete, try to boot to the new drive. This fixed the black screen issue for this PC. After this it started normally. I returned it to the owner before trying to fix the bad hard drive. I would have liked to try simply restoring the good boot sector to the bad hard disk and see if that would fix it, but at the time didnt want to alter the original drive. Partition Wizard free edition, resize or split existing partitions without damaging the data, simple. Worked great. 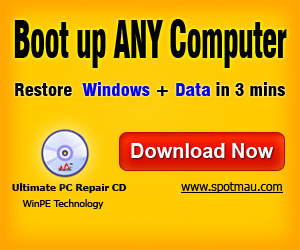 UBCD4WIN for Xp boot disk, rescue disk, fix problems in Xp, recover your data supports USB drives, scan with popular antivirus tools malwarebytes, superantispyware etc, and manually restore the registery when infected, all even when Xp wont boot. PREVX black screen repair tool, fixes a lot of black screen issues, try this first. i can go to BIOS and i can F8 to safe mode…. I have a Seagate Barracuda 500gb HDD and it suddenly went RAW. So, I did as you said but nor fixmbr neither fixboot could be executed. Hi Mitz, I have a less than year old (how sad huh?) 17” Toshiba Gateway that I received as a birthday gift in January of this year. Not even four months later, I started getting bluescreens for nothing at all and couldn’t diagnose the problem. I have a PAID version of Avast internet security that is kept up to date, so I was really expecting it not to be a virus problem. I let it go for a while (I’m out of the country on a working holiday visa, so I didn’t want to try and figure out how to communicate with a non-English speaking techy until absolutely necessary!) and I started getting an error saying “Warning, your Hard Disk Drive is failing and you should back up all files immediately to prevent loss”. This was at not even 5 months of using the thing. It’s always been on a solid surface in a well-ventilated area, though it did tend to get a bit warm on occasion. I guess Toshiba hasn’t perfected the art of fans yet heh. Anyway, I thought it was a weird malfunction related to the bluescreens and ignored it, though the computer was always a bit slower and slower after that. Surely enough, I went to start up my computer one day two months later and it didn’t start. It wouldn’t load Windows 7 normally, it just tried for a good five minutes with the windows logo and swirly dots and restarted by itself. So I went into safe mode, and it didn’t start either. I left it for 6 hours to go to work, came back, and it said there was an error preventing safe mode from starting. I did another restart (ouch) and tried again. Left it for nearly a day waiting for safe mode to boot and it just never did, eternal black screen with a cursor. So now I’m at the hard part. I lost my warranty in my luggage so this is going to inevitably cost me, I know. My question is- do you think the problem is fixable by the software you recommended? Or do you think the entire Hard Drive is actually unfixable and needing to be replaced? I left my recovery disks back home, thinking surely I wouldn’t need them in less than a year, so I can’t go in and try to fix it myself. The boot disc above does repair the boot sector on the harddrive..but I think your hard drive failed as you had blue screens and had a warning saying your hard drive failed…“Warning, your Hard Disk Drive is failing and you should back up all files immediately to prevent loss” I would try another hard drive..Go to the computer shop and ask them to test your hard drive…If they can show you it doesn’t work then buy a harddrive from them.. I have a HP Compaq Desktop. When I turn the power on it turns on and stays black with a flashing underscore (_). I press ctrl+alt+delete and it takes me to a blue screen BIOS ( the set up) . I tried switching boot options and nothing. If I press F8 or any other option it just takes me to the BIOS page. HELP PLEASE. What am I supposed to do ? Hi Mitz, first off i am glad to see someone actually replies here thank you for that! my issue:I have a WD 500gb drive that was disconnected improperly and now it’s giving the ‘You have to reformat Drive to be able to use it” message when plugged in, while it has 400gb of valuable data, (all of my wife’s pictures and videos collection). I’ve searched around and it sounds like the boot sector is damaged and found a bunch of utilities like Fixboot or Mbrfix, or one by Easus, they all promise to fix the issue and allow you to recover the data, though as valuable as the data is, they just sound complicated and risky to use. Is there an easier way for a not so tech savvy person to be able to safely recover the data and by pass or fix the problem or any of these utilities that you have actually used and recommend…? we’re on windows 7 and you would think windows should have an utility for this. We would greatly greatly appreciate your advice. Thank You! I’m running vista and am trying to repair a corrupt boot sector. when I hit ‘repair’ I get the ‘system recovery options’ window but no os is listed. I click next and then command prompt but none of the commands (fixmbr, fixboot etc) is recognized as an ‘internal or external command, operable program or batch file’. the default drive is X and i can’t change to C drive. I am amazed by you knowledge of computers. I was surprised to finally find someone with a strong knowledge of computers that actually responds to questions sent to them!! I hope you can help me as well! I am having trouble getting my computer to restart after installing updates on my computer. This includes updates from window, defender and Microsoft Security Essentials. 2. When I do, a screen stating that the updates are being installed will appear. 3. Next, the computer will attempt to restart. 4. The next screen that appears is a black screen with “Microsoft Corporation” and the rolling line that appears when the computer is booting. This screen will stay up almost indefinitely. 5. Next, a box will appear that states that “Windows was unable to restart the computer” and it gives me the option to allow windows to do the repair. 6. Next, it says that it was unable to do the repair and offers me the option to restore to the last working point, which I have done several times at this point. It always restores to the point before the updates. Each time it is harder to get the computer to start up, and I am now afraid to update or turn off my laptop! Is this a virus or a booting problem? How do I fix this?? This is very common especially when there are a few done at the same time..
what is the computer doing now? Is it slow, it is starting and booting into Windows? After restoring can you now try a repair? What operating system do you have? If you have Windows seven or vista..when you choose the repair option there should be a system files option to repair. I have tried doing each of the updates alone and the computer still behaves the same. My computer is working better now. I downloaded a different virus protection program (Ad-Aware) that seems to have cleared up many of the problems. It always booted in windows, but it would take a long time and it would only do it after restoring. My OS is Vista. Since I downloaded Ad-Aware I haven’t had any problems restarting my computer, but it turned off all of my plugins which changes the way I use the internet. Is it safe to turn them back on, or should I leave them off?? Well, though I tried to rescue my laptop, I ended up getting a new one. I did have Microsoft Security Essentials as well as Ad aware, Malware bytes and Ccleaner. I did start having problems again with restarting the computer. Sunday morning I tried to start up my computer, and it wouldn’t power on. I check my cord and it was fried! I took the computer and the cord to the computer repair shop, and it turned out that the port for the plug was broken and shorted out the cord and my computer. I got three years of hard use out of that computer, so I still feel I got my money’s worth. Sad to see it go. Nice to be getting to know a new friend!! Thanks for your help! i have a gateway laptop that won’t makes it through post and then goes to a black screen with no cursor or indication of operations. i cant boot the hard drive or from a cd/dvd… i need help with this problem. i have a blank hard drive with no operating system installed and no data. but I cant seem to get as far as to boot from a disk or anything. please help…. I left my PC switched on overnight & in the morning the screen was just a bunch of flashing #’s & letters. I switched it off & now when I boot it up I just get a black screen with a single flashing cursor in the top left hand corner. I tried replacing the harddrive & the memory but neither helped. Even with no Hard drive connected I get the same screen. I also tried the boot CD but won’t work either? ROM BASIC or other error message. The message displayed is dependent upon the computer’s BIOS. This error message is displayed when the boot sector of a defined partition is damaged. The error message is normally received using a new partition that has not been formatted. However, if the boot sector is damaged, the partition may appear unformatted to the operating system, and this error message is generated. This error message indicates either the hard disk controller has failed, the hard disk controller is not set up properly in the BIOS, or the controller cannot communicate with the attached drive(s). In this case, do not perform the troubleshooting steps below. Instead, consult the documentation included with your computer or contact the computer’s manufacturer for more information. I was given a computer, Toshiba satellite l25-s119, It has windows xp installed on it. I wanted to reset to factory settings. I have the original disks that came with the computer from Toshiba. During the install it reached a screen that asked me to “press any key to continue”. When I did that nothing happened. On my other computer I tried to research the problem. I tried a usb keyboard with no luck. The laptop doesn’t have an input to use an older keyboard with the adapter. (The name of the adapter escapes me) I tried to restart the install, not realizing what a bad idea that was. Now I’m left with a black screen, no beeps, but all other sounds are normal. I tried pressing every F# key possible while starting up. No bios screen comes up. I had just purchased a new ram so I would have extra. I tried it with just the new ram no luck. Power supply is good as it fits my other computer and that one works. Interchanged with known good power supply no luck. Now I was reading your suggestions and I’m at the step where your suggesting entering bios to change the boot order or sequence. How do I do that if the screen is still black? I read the link on how to enter bios but I can’t figure it out. Help! So there is absolutely no beeps or no bios..No sounds? Any fans running? Which key did you press when it said “press any key” ? a:) Which computer make u have? Notebook PC? How old is ur PC? b:) Which operating system and Service Pack? c:) What after these warning messages? Did ur PC Loads the operating System or unable to boot at all? d:) How many partitions on your Hard Disk? Did any one of them becomes inaccessible (if OS loads even after these warning messages)? or No Booting at all. Computer is fully useless, as for now? e:) Did you perform any major changes to your PC, since this problem occurs? f:) What application you were working on Last when this problem highlights first to you? Was it Internet Explorer (Which Version)? g:) Do you have an updated antivirus? Norton or AVG? h:) Anything else specific you would like to tell about these warning messages? Don’t worry. I M SURE ITS NEITHER HARD DISK NOR MOTHER BOARD. I keep getting not responding program errors and my computer is running very slow. I think there is a virus or something in the boot sector or master boot record. The computer never came with the O.S. disk it was built in the the system. Can I still get the O E M O.S. disk for this computer and is it worth fixing ? Its max. ram is 2 Gig? Hmmm… What about computer maintenance? Has this been done on this computer? Maybe it is full of junk and files? Could this be the problem? I have the black screen after a Windows update (from disk). On reboot, I get the windows startup screen, then a black screen with small cursor (flashes 3 times) then it goes to a black screen with “We apologize for the inconvience, but Windows did not start successfully.” I then have Safe Mode, Safe Mode with Networking, Safe Mode with Command Prompt, Last known good conf, and start windows normally as options. Each of these options on reboot just repeats this process and I’m unable to get into windows. I have reset the bios to boot from disk as i have the boot disk. I think I need to repair the MBR but I can’t access it. Suggestions? Have you looked at the display driver and can you start in safe mode without problems??? I have a black screen with only my curser showing. I can’t open the CD Drive to insert a disk. I can enter my computer in safe mode but I still can’t get the CD drive to open. Is the light on the cd tray working? Maybe there is a problem with that? If you can get into your bios by entering setup, you should check the boot sequence and set it to go straight to the hard drive. I dont have the Windows Xp CD what I should do? can buying a new hard drive solve this problem? yes because you will have a new hard drive with its own boot sector undamaged.